It’s about time I introduced my Sailor Moon poster. I’ve had it since maybe kindergarten or first grade, I believe…which was like 15 years ago??? Holy crap, way to feel old. Even though I realize I’m still a youngster in other aspects, haha. In kindergarten I became obsessed and in love with the Sailor Moon TV show. It was the American dubbed version obviously, but as a little kid you don’t really notice the terrible American voice actors at this young age. >_< Boy did I love Sailor Moon. I watched it every day. Since it’s so old, this wall scroll poster of mine is so faded now, but it really has stood against the test of time since it still looks pretty great! 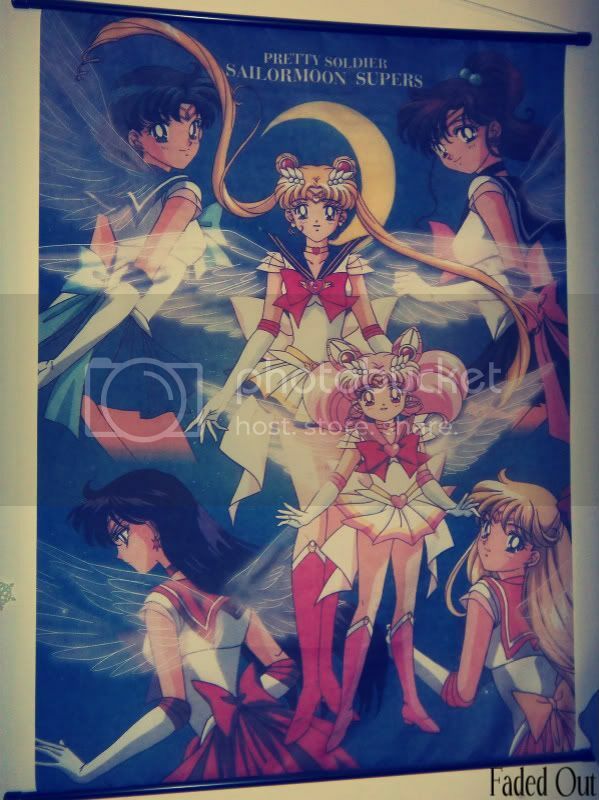 I didn’t take a picture of it but right next to it are three more laminated-paper-type Sailor Moon posters, hehe.